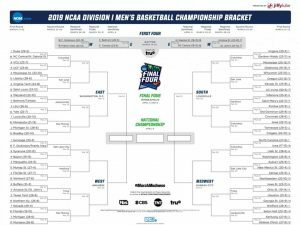 I’ve been thinking a lot about odds–good odds, bad odds, no odds–because as soon as I finish writing this blog I’m filling out my bracket for the NCAA basketball championship as I attempt to predict all 67 game winners. The odds I will do that correctly are rather slim: 1 in 9.2 quintillion, according to a DePaul University mathematician. (For the record, a quintillion is a billion billions!) Needless to say, no one in the history of the tournament has ever had a verifiably perfect bracket and you can be sure I won’t either! You may or may not be a college basketball fan, but chances are you think about odds, too. Maybe the survival odds a physician has given you or a loved–or those you’ve read about online. Perhaps you’re considering the odds your marriage will survive or whether you ever will get married. Maybe the odds you’re contemplating are whether or not you’ll get the money to pay your bills or if you’ll find a much-needed job. Perhaps the odds seem to be stacked against you…and maybe they actually are. I remember when I was diagnosed with cancer in 1990 at the age of 36 and given about a 40-percent chance of survival, I felt overwhelmed by those odds. But as I began to consider the God of scripture, I knew He didn’t need good odds to achieve a victory. What do you think the oddsmakers would have given the shepherd boy David vs. the giant Goliath? What were the odds Sarah would give birth at the age of 90? What was the possibility that 5,000 men, plus women and children could be fed with five loaves of bread and two small fish…and even have leftovers? How likely was it that a Jewish carpenter would walk out from a sealed tomb three days after being tortured and crucified? If you or your loved one is facing an uphill battle of tough odds, please remember that God doesn’t need good odds to heal–and that’s any kind of healing: mental, emotional, spiritual and physical. Maybe your loved one is near death or already has passed away and you’re thinking there’s a 100-percent chance you can’t make it without them. I want to remind you that “the stage is set for His might.” You may not get over this loss, but by God’s presence and power, you will get through it.